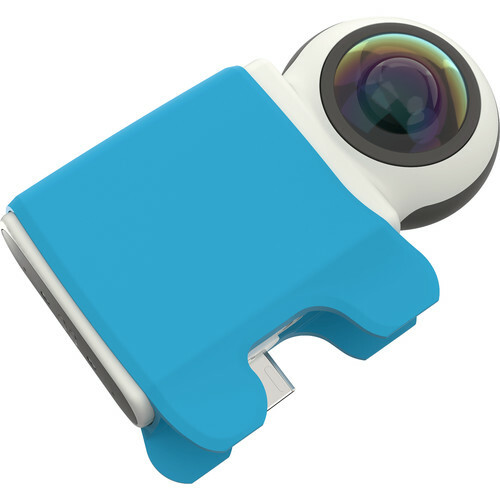 The iO's dual custom lenses offer real-time HD image processing in a pocket-sized design. Connect to your smartphone or tablet instantly for immersive capture capabilities. Hold on to the essence of precious moments and capture any experience in its entirety. Share photos and videos instantly. Switch to live broadcasting mode and share your moments with the world instantly. iO is natively compatible with live streaming platform including Facebook, Twitter, and YouTube. The iO enables you to shoot immersive virtual reality video, so your audience can experience the footage as if they're really there. Box Dimensions (LxWxH) 5.45 x 4.75 x 1.95"
iO Spherical Video Camera for Android Devices is rated 3.0 out of 5 by 1. Rated 3 out of 5 by John from Be careful of your phone port. Make sure your phone uses the older micro USB port. The newest phones are using a different post. Mine will be fine because I love my older LG. Does this camera need it's own software? I read that the software is not available anymore? Is it still a good buy?